Coral reef aorta is an uncommon syndrome caused by a distribution of rock-hard calcifications in the visceral part of the aorta. These heavily calcified plaques grow into the lumen and can cause significant stenoses, which may develop into visceral ischemia, renovascular hypertension, and malperfusion of the lower limbs. We report here our surgical experience in treating 138 patients. The main symptoms were renovascular hypertension (69.5%), limb claudication (55%), and chronic visceral ischemia (31.1%). One hundred thirty-five (97.8%) of the 138 patients were treated through vascular operations, including open thromboendarterectomy (TEA) of the aorta in an isolated suprarenal segment in 12 cases (8.8%) and the supra- and infrarenal aorta in 123 cases (91.1%). 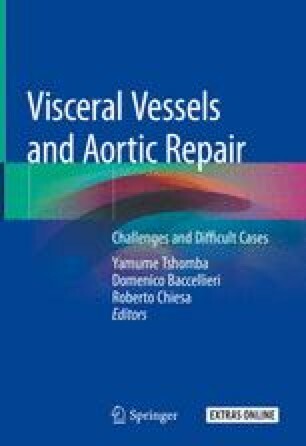 Aortic repair was performed with aortoaortic (n = 27), aortoiliac (n = 31), or aortofemoral (n = 35) bypass; 42 cases were treated instead with aortic patch repair. Visceral and renal arteries with atherosclerotic involvement were treated with TEA in 59 cases, and bypass reconstructions were performed in 20 cases. Postoperative complications requiring corrective surgery occurred in 12 patients (8.8%). The overall rate of relevant complications was 25.9% (n = 35). Coral reef aorta is a rare, unique disease of the juxta- and infrarenal aorta that is often associated with severe atherosclerotic disease in other domains. Surgical treatment offers good results, and a timely operation is advocated to avoid loss of kidney function, complications of long-standing hypertensive disease, and wasting from intestinal malperfusion.